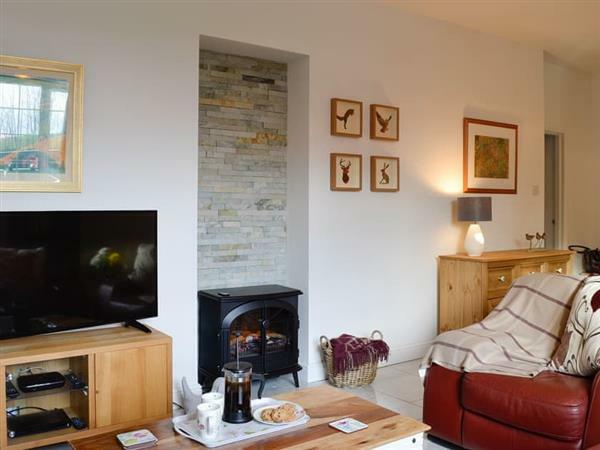 Park Cottage in Dunragit, near Stranraer, Dumfries and Galloway sleeps 3 people. Park Cottage near Stranraer is a semi-detached cottage which is situated in the quiet village of Dunragit, close to the bustling harbour town of Stranraer. Stranraer, situated at the head of Loch Ryan, is the gateway to the Rhinns of Galloway and for more than a century was a busy ferry port for services between south-west Scotland and Northern Ireland. The town has many shops and there are plenty of places to dine out too. This area of Dumfries and Galloway boasts rugged coastlines and secluded sandy beaches which benefit from the warmth of the passing Gulf Stream and is surrounded by breathtaking scenery, offering an ideal base from which to explore the Machars Peninsula and the Galloway Hills. Just to discover this peaceful region with its unspoilt countryside and virtually traffic-free roads is a pleasure in itself. There are many beautiful gardens to explore, including the world renowned Logan Botanical Gardens, which is a paradise to behold. The area boasts many pretty little ports like Sandhead, Portpatrick and the Isle of Whithorn, and the RSPB Scotland Mull of Galloway Nature Reserve is also worth a visit, where thousands of seabirds nest in the cliff face during spring and summer. Walking is a delight - whether clifftop, beaches, hills and forests, and the Southern Upland Way also passes close by. This is also a cyclists paradise with the 7stanes within easy reach. If fishing, shooting or golf is your interest, there are many facilities nearby, including five 18-hole golf courses and four salmon rivers. The beach is 5 miles from Park Cottage near Stranraer. With the shop 2 miles, and the pub & restaurant is 6 miles from Park Cottage. Living area: With electric wood burner, Smart TV and DVD player. Study: With single sofa bed. LPG central heating, electricity, bed linen, towels and Wi-Fi included. Welcome pack. Enclosed garden with sitting-out area and garden furniture. Bike store. Private parking for 2 cars. No smoking. Holidays at Park Cottage run from Friday to Friday. For a better idea of where Park Cottage is, you can see Park Cottage on the map below. Park Cottage is in Wigtownshire; should you be on the lookout for a special offer, you can find all the special offers in Wigtownshire. It's always worth checking to see what is on offer at the moment. Do you want to holiday near Park Cottage (UK10623), you can see other cottages within 25 miles of Park Cottage; have a look to find your perfect holiday location.